CCTV, Access Control, Perimeter Fencing etc. With a list of 46 products range BGIL is a true Product based company having 19 IPRs (probably only company in India) into Applications related to automation of Security, Surveillance & Safety, Communication (Mobile Applications). 'BGIL' has a top ranking clientele which includes Fortune 500 companies, having successfully delivered more than 370 projects till date including few 'first one of its kind' projects in India. During the period BGIl's experienced team have successfully developed a complete products started last year namely 'Automatic Parking Ticket Dispenser', 'Parking Exit Verifier and Kiosk based Smart Card Dispenser', 'Smart Card Drop-Box and Access Control System' which offers import substitute and has a good marketable aspects. Canteen Management System (CMS) at 5 sites of Price water house Coopers (PWC) have been upgraded to centralized online system PAN INDIA Basis. After the successful PMS implementation at Sector 132 ADOBE awarded a new site at their Bangalore Head Office; this will be the second site by ADOBE; BGIL is expecting one more site soon. BGIL has recently upgraded its all its CMS installations PAN INDIA basis at PRICE WATER HOUSE (PWC). 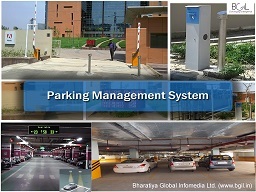 BGIL has been successfully implemented parking mangement system at R CITY MALL & RUNWALL GREENS. BGIL has emerged as a leader in other segments also viz. Facility Management Solutions besides Parking & Traffic Engineering Solutions having recently won Visitor Mgt Systems from AON HEWITT, Visitor Tracking Solution from MEDANTA HOSPITAL . BGIL has Completed Parking Management System(PMS) at six NDMC-DIMTS sites successfully, rest are under progress...!